Ikeja the capital city of Lagos became a beehive of activities on Saturday, 28th of October, 2017 as Ugochi Moremi Amuta and Chidiebere Benjamin Elekwachi tied the nuptial knot.Captains of industries, media practitioners ,family, friends and well wishers all trooped in to celebrate with latest couple in town. City People’s reporter FEMI FABUNMI, attended the classy event and now serves you gist. The solemnization of holy matrimony was carried out at the Archbishop Vining Memorial churchOba Akinjobi Road, G.R.A Lagos and it was filled to the brim . The Bishop of Lagos diocese, Rt Rev. James OlusolaOdedeji was the officiating minister of the day and he presided over the wedding. He prayed for the couple and advised them to settle their differences within themselves without involving the third party. The parents of the bride and groom were asked to proceed to the inner room to sign the consent register. Mr Sunday Olawuwo; Organist, Mr Adetunji Adekoya& Bode Ogunlela;Wardens, Rev Ayodeji Oluwatosin, Rev Opeyemi Ibikunle, Rev Dr. Benjamin Chijoke Okere, Rev .Taiwo Adebayo, Rev Oluwambe Toriola, Canon AzubuikeAhubelem, Rev Canon James Adekanye,Ven Gbenga Oniye. 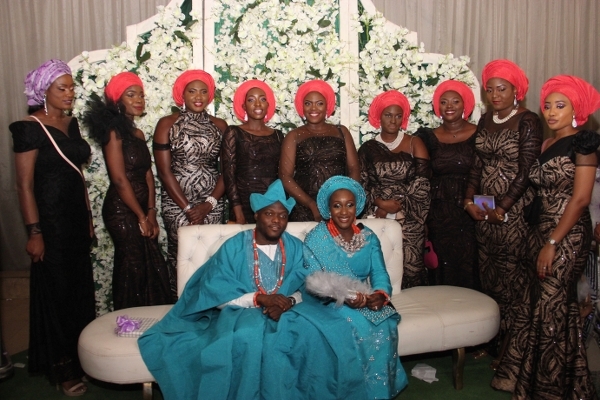 Immediately after the white wedding was over attention ,was diverted to the 1000 sitting capacityOstra event center Alausa , Ikeja for the reception party. The decoration, lighting and sound effect were perfect.Guests were treated to a very nice reception party. Security at the venue was very tight as gate crashers were denied entry at the gate of the hall. Showing the party’s invite was not enough as it was subjected to confirmation on the organizers list. Everyone whose name was not on the list was turned back even if such person had an invite. When it was time for the beautiful & handsome couple to make an entry into the hall, everybody stood up to catch a glimpse of the two love birds. The bridal train and the groom’s men were the first to enter with juicy dance steps while the couple also followed suit, they got a standing ovation and applause from the guests. There was a heated argument in the reception hall and it was centred on who was the better dancer between Ugochi the bride and the groom Benjamin,both of them danced very well , as they tried to outsmart eachother on the dance floor. Chidiebere Benjamin Elekwachi is a media expert,he is into multimediaand the chief Executive officer of SPS production. Meanwhile the bride, Ugochi Moremi Amuta attended the University of Georgia for her first degree, she proceeded to University of Califonia for her masters degree she is also into multimedia and PR consulting. She is the boss of Euphoric firm. Former Rivers state governor and Nigeria’s present minister of petroleum RotimiAmaechiis a friend of the bride’s father and he made his presence felt at the reception. He advised the couple on marital issues before taking his leave minutes later. Former Abia State gubernatorial aspirantwho contested on the auspices of APGA, Diamond Bank GMD and Business Mogul Alex Otti also attended the classy event in company of wife and few entourage.Alex was beaming with smiles all through the duration of the event. Alhaji BY Muhammed. Former special adviser on media matters to Military president Ibrahim Babangida Alhaji BY Muhammed was in attendance too and he made his presence felt by spending quality time before leaving the event venue. 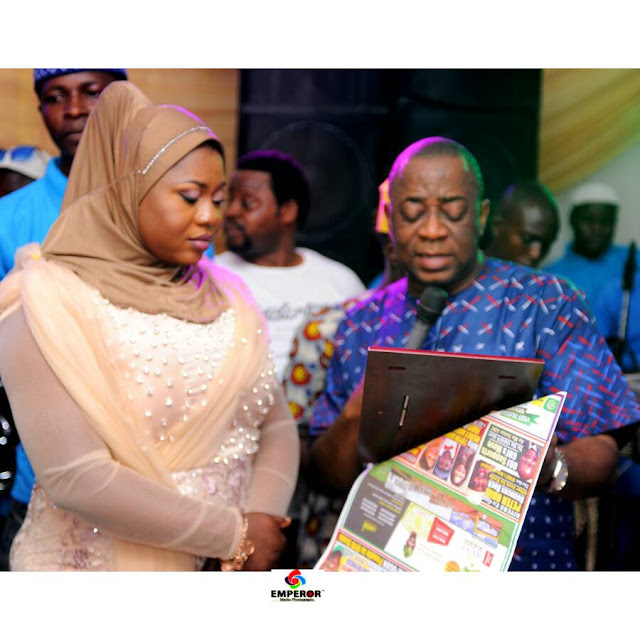 Not many people knew that behind the beautiful face lies a sonorous voice, not untillthe bride Ugochi Moremi Amuta grabbed the microphone and sang a beautiful love song for her hubby. She got a standing ovation and applause for that. Guests at the reception were treated to tasty local and international delicacies courtesy of Sisi Pepper Consult catering company. The food was on point whilst B&B assorted drinks were served freely on request at the venue. Carefully selected persons from both families mounted the podium and grabbed the microphone they offered quality pieces of advice to the newest bride & groom. Immediately after the wedding reception party was over, a traditional wedding was quickly organized and it was short and classy. Every guests was stunned with the organization of the traditional wedding. The bride and groom changed from the wedding gown and suit to traditional wears and it looked good on them. Apart from doing the Hip Hop dance very well during the reception party , Ugochi and Benjamin rocked the traditional Igbo dance fantastically well. Everyone looked in their direction as they danced on. The Igbo tradition was showcased during the traditional wedding as the event was put on hold until the breaking of Kola was done by elders , that process kick started the traditional wedding ceremony.